The MESC-type Twin Shaft Paddle Mixer (MESC-UM as conditioner with liquid injection) is among the most efficient yet economic mixer types when it comes to conditioning dust or inerting sludge. MESC-type Twin Shaft Paddle Mixers (MESC-UM with liquid injection as conditioner) are equipped with two parallel counter-rotating, intermeshing paddle shafts. The adjustable angle of inclination of the mixing paddles allows perfect adaptation to different material characteristics and mixing process requirements. 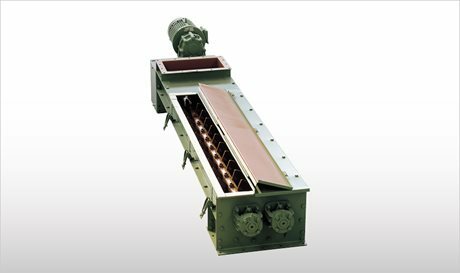 MESC-type Twin Shaft Paddle Mixers are used for powder mixing, sludge granulation and neutralisation, as well as for dust, ash, or sludge conditioning.